When I started my first job as a professional newspaper reporter (This job also served as an internship during my junior year in college — I just didn’t leave for about 6 years. ), I quickly realized that all my experience, and all my years of journalism education had not been enough to help me write stories about drug busts, fatal car accidents and tornadoes. All the theoretical work I’d done, and all of the nifty little scholastic and collegiate stories I had done, did not prepare me for real world writing. At that point, I had to find a solution quickly. After all, I had a deadline to meet, and it was only a few hours away. One of my colleagues, who also served as a mentor, had the solution. She introduced me to the newspaper’s “morgue.” This was a room filled with filing cabinets in which we kept old — dead — stories arranged by reporter. Whenever I wasn’t’ sure how to write a story, all I had to do was check the morgue for similar stories. If I needed to write a story about a local drug bust, for example, I’d find another story on a similar incident, study its structure, and mentally create a formula in which to plugin the information I’d gathered. Once I’d gained more experience, and had internalized the formula for that particular type of story, I felt free to branch out as the situation — and my training — warranted. I do the same thing when I want to write a type of letter, brochure, or report that I’ve never written before. This is what writing looks like in the real world. Research by “Write Like This ” author Kelly Gallagher indicates that if we want students to grow as writers, we need to provide them with good writing to read, study, and emulate. My personal experience backs this up, as does the old adage “all writing is rewriting,” oft quoted by everyone from LA screenwriters to New York Times bestselling authors. Of course, if you’re a new teacher like me, there is one problem with providing mentor texts to my students: I have a dearth of middle school level writing sitting around in my file cabinets. Fortunately, the Internet is full of sources, so I scoured the bowels of Google to find examples. I know how busy you are, so I’m sharing. 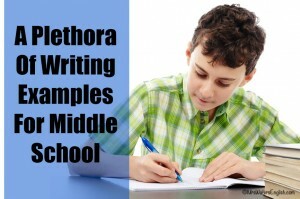 Below are several sources of expository writing samples for middle school students. Finally, here is an article in the New York Times that will help you teach your students real-world expository writing skills. If you know of any other online writing example sources, please feel free to share them in the comments below. I am a secondary English Language Arts teacher, a University of Oklahoma graduate student, and a NBPTS candidate. I am constantly seeking ways to amplify my students’ voices and choices. For seven years, I was a writing teacher. Yes, I was certified to teach the full spectrum of English language arts—literature, grammar and usage, speech, drama, and so on—but my absolute favorite, the thing I loved doing the most, was teaching students how to write. Most of the material on this site is directed at all teachers. I look for and put together resources that would appeal to any teacher who teaches any subject. That practice will continue for as long as I keep this up. But over the next year or so, I plan to also share more of what I know about teaching students to write. Although I know many of the people who visit here are not strictly English language arts teachers, my hope is that these posts will provide tons of value to those who are, and to those who teach all subjects, including writing. So let’s begin with argumentative writing, or persuasive writing, as many of us used to call it. This overview will be most helpful to those who are new to teaching writing, or teachers who have not gotten good results with the approach you have taken up to now. I don’t claim to have the definitive answer on how to do this, but the method I share here worked pretty well for me, and it might do the same for you. If you are an experienced English language arts teacher, you probably already have a system for teaching this skill that you like. Then again, I’m always interested in how other people do the things I can already do; maybe you’re curious like that, too. Before I start, I should note that what I describe in this post is a fairly formulaic style of essay writing. It’s not exactly the 5-paragraph essay, but it definitely builds on that model. I strongly believe students should be shown how to move past those kinds of structures into a style of writing that’s more natural and fitting to the task and audience, but I also think they should start with something that’s pretty clearly organized. 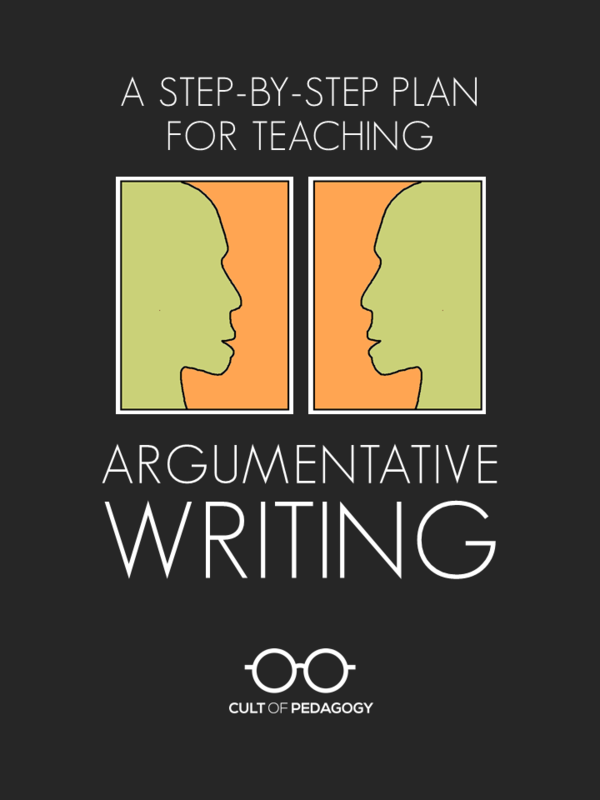 So here’s how I teach argumentative essay writing. One of the most effective ways to improve student writing is to show them mentor texts, examples of excellent writing within the genre students are about to attempt themselves. Ideally, this writing would come from real publications and not be fabricated by me in order to embody the form I’m looking for. (Although most experts on writing instruction employ some kind of mentor text study, the person I learned it from best was Katie Wood Ray in her book Study Driven). Since I want the writing to be high quality and the subject matter to be high interest, I might choose pieces like Jessica Lahey’s Students Who Lose Recess Are the Ones Who Need it Most and David Bulley’s School Suspensions Don’t Work. I would have students read these texts, compare them, and find places where the authors used evidence to back up their assertions. I would ask students which author they feel did the best job of influencing the reader, and what suggestions they would make to improve the writing. I would also ask them to notice things like stories, facts and statistics, and other things the authors use to develop their ideas. Later, as students work on their own pieces, I would likely return to these pieces to show students how to execute certain writing moves. Although many students might need more practice in writing an effective argument, many of them are excellent at arguing in person. To help them make this connection, I would have them do some informal debate on easy, high-interest topics. An activity like This or That (one of the classroom icebreakers I talked about last year) would be perfect here: I read a statement like “Women have the same opportunities in life as men.” Students who agree with the statement move to one side of the room, and those who disagree move to the other side. Then they take turns explaining why they are standing in that position. This ultimately looks a little bit like a debate, as students from either side tend to defend their position to those on the other side. Every class of students I have ever had, from middle school to college, has loved loved LOVED this activity. It’s so simple, it gets them out of their seats, and for a unit on argument, it’s an easy way to get them thinking about how the art of argument is something they practice all the time. Once students have argued without the support of any kind of research or text, I would set up a second debate; this time with more structure and more time to research ahead of time. I would pose a different question, supply students with a few articles that would provide ammunition for either side, then give them time to read the articles and find the evidence they need. Next, we’d have a Philosophical Chairs debate (learn about this in my discussion strategies post), which is very similar to “This or That,” except students use textual evidence to back up their points, and there are a few more rules. Here they are still doing verbal argument, but the experience should make them more likely to appreciate the value of evidence when trying to persuade. Before leaving this step, I would have students transfer their thoughts from the discussion they just had into something that looks like the opening paragraph of a written argument: A statement of their point of view, plus three reasons to support that point of view. This lays the groundwork for what’s to come. Next I would show students their major assignment, the performance assessment that they will work on for the next few weeks. What does this look like? It’s generally a written prompt that describes the task, plus the rubric I will use to score their final product. Anytime I give students a major writing assignment, I let them see these documents very early on. In my experience, I’ve found that students appreciate having a clear picture of what’s expected of them when beginning a writing assignment. At this time, I also show them a model of a piece of writing that meets the requirements of the assignment. Unlike the mentor texts we read on day 1, this sample would be something teacher-created (or an excellent student model from a previous year) to fit the parameters of the assignment. Before letting students loose to start working on their essays, I make sure they have a solid plan for writing. I would devote at least one more class period to having students consider their topic for the essay, drafting a thesis statement, and planning the main points of their essay in a graphic organizer. I would also begin writing my own essay on a different topic. This has been my number one strategy for teaching students how to become better writers. Using a document camera or overhead projector, I start from scratch, thinking out loud and scribbling down my thoughts as they come. When students see how messy the process can be, it becomes less intimidating for them. They begin to understand how to take the thoughts that are stirring around in your head and turn them into something that makes sense in writing. For some students, this early stage might take a few more days, and that’s fine: I would rather spend more time getting it right at the pre-writing stage than have a student go off willy-nilly, draft a full essay, then realize they need to start over. Meanwhile, students who have their plans in order will be allowed to move on to the next step. The next seven to ten days would be spent in writer’s workshop, where I would start class with a mini-lesson about a particular aspect of craft. I would show them how to choose credible, relevant evidence, how to skillfully weave evidence into an argument, how to consider the needs of an audience, and how to correctly cite sources. Once each mini-lesson was done, I would then give students the rest of the period to work independently on their writing. During this time, I would move around the room, helping students solve problems and offering feedback on whatever part of the piece they are working on. I would encourage students to share their work with peers and give feedback at all stages of the writing process. If I wanted to make the unit even more student-centered, I would provide the mini-lessons in written or video format and let students work through them at their own pace, without me teaching them. (To learn more about this approach, read my post on self-paced learning). As students begin to complete their essays, the mini-lessons would focus more on matters of style and usage. I almost never bother talking about spelling, punctuation, grammar, or usage until students have a draft that’s pretty close to done. Only then do we start fixing the smaller mistakes. Finally, the finished essays are handed in for a grade. At this point, I’m pretty familiar with each student’s writing and have given them verbal (and sometimes written) feedback throughout the unit; that’s why I make the writer’s workshop phase last so long. I don’t really want students handing in work until they are pretty sure they’ve met the requirements to the best of their ability. I also don’t necessarily see “final copies” as final; if a student hands in an essay that’s still really lacking in some key areas, I will arrange to have that student revise it and resubmit for a higher grade. So that’s it. If you haven’t had a lot of success teaching students to write persuasively, and if the approach outlined here is different from what you’ve been doing, give it a try. And let’s keep talking: Use the comments section below to share your techniques or ask questions about the most effective ways to teach argumentative writing. If you’re a writing teacher in grades 7-12 and you’d like a classroom-ready unit like the one described above, including mini-lessons, sample essays, and a library of high-interest online articles to use for gathering evidence, take a look at my Argumentative Writing unit. Just click on the image below and you’ll be taken to a page where you can read more and see a detailed preview of what’s included. Join my mailing list and get weekly tips, tools, and inspiration—in quick, bite-sized packages—all geared toward making your teaching more effective and fun. To thank you, I’ll send you a free copy of my e-booklet, 20 Ways to Cut Your Grading Time in Half, which has helped thousands of teachers spend less time grading!